President George W. Bush’s first State of the Union (SOTU) address won strong praise from the public, but caused some concern among analysts. Shorter than most recent SOTU’s, the rhetoric of this address was direct and simple. But what caused concern was the lack of clear objectives in both parts of the speech. To be fair, Bush faced a difficult set of tasks as he approached this SOTU. His popularity levels are extremely high and so too are the public’s expectance levels. In almost every poll, Bush’s favorability rating is above 80%. People like him and have confidence in his leadership. The President’s high ratings and the relative care with which the U.S. defeated the Taliban have generated an unexpected consequence. Not only do polls show that Bush’s ratings are high, but they also show that the public’s confidence in the ability of government to solve problems is also quite high. While Americans are still wary of the threat of terrorism, they are now focused on the economy and issues of economic security. In poll after poll, majorities of the public are now showing greater concern with issues brought on by the recession: creating new jobs, benefits for the unemployed, social security reform, and health care benefits. But consider Bush’s dilemma. He is a conservative whose political base wants to reduce the size and responsibilities of government, facing a public that is now looking to government to solve problems and with restored confidence in its ability to make a difference. The President’s difficulties are compounded by a few other unpleasant realities. This is, after all, an election year with control of both Houses of Congress being contested. The partisan divide is deep and the President must find a way to bridge the gap. If, in an effort to find solutions, he moves too far toward the Democrats, Bush runs the risk of repeating his father’s mid-term error and losing the support of his conservative base. On the other hand, if he holds firm and fails to find legislative solutions to the nation’s ills, the public may grow frustrated, causing the President to lose support. He is, as one pundit noted, ” a 48% president with 80% ratings”, and must, therefore, continue to find ways to maintain his high support levels so as to be able to lead in the two wars he is waging: the wars against terrorism and the recession. It appears that the strategy the White House has developed is to continue to play to the President’s strong suit. The American people like him and trust his directness. And, so far, they have not wearied of the war on terrorism. Hence, the SOTU was largely a “war speech”, wrapping both the foreign danger and the nation’s domestic threats into one package. The early results seem to indicate that it is working. Public reaction to the address and the campaign that preceded and followed it are quite positive. Ninety-four percent of those who heard the speech were impressed and the President’s already high ratings went even higher. Democrats were put in a quandry. They feel that they must continue to support the “war on terror”, but are struggling to find a way to show their concern with the President’s domestic agenda. As one Democratic leader framed his party’s response, “just because we stand shoulder to shoulder with the President’s foreign policy doesn’t mean that we will be toe to toe on his domestic proposals.” Polls are now showing that the public is supporting not only the Republican party’s approach to national security, but they give the President’s party the edge in solving a whole range of domestic issues as well. But what exactly is Bush proposing and will it work? When looking beyond the rhetoric, problems begin to appear. The problem of Afghanistan is still not solved, and there are serious debates over the next steps to be taken. It is still not clear whether the U.S. will make a long-term commitment to nation building in that war-devastated country. Bin Laden has not been captured and al Qaida remains a mystery. Shifting focus to an “axis of evil” might be a useful rhetorical tool, but this raises more questions than it provides answers. And while the public’s mood clearly supports the President’s suggestion that the U.S. might “go it alone” in dealing with this “axis”-already U.S. officials are suggesting that this will not be the case. Analysts, too, are warning that the U.S. must not “bite off more than it can chew”. And political commentators are cautioning that without specific and realizable goals, a “war weariness” may set in, doing the Administration more harm than good in the long term. On the domestic front there may be concerns as well. The Enron scandal may not have direct political consequences for the Administration, but it is hanging, like a dark cloud, over politics in Washington. If anything, this situation has put the issues of campaign finance reform and the influence of big business on government decision-making back on the agenda. These are both unwelcome distractions for the President. Finally, while the President proposed a number of initiatives in the last part of his address, the fact that this year the government will return to deficit spending remains a concern. In this context, Bush will have to juggle his insistence on tax cuts-which may only increase the short-term deficit-with the public’s insistence that the government do something to pull the nation out of recession and provide economic security for those affected by the recent downturn. 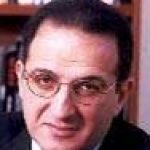 Dr. James J. Zogby is President of Arab American Institute in Washington, DC.